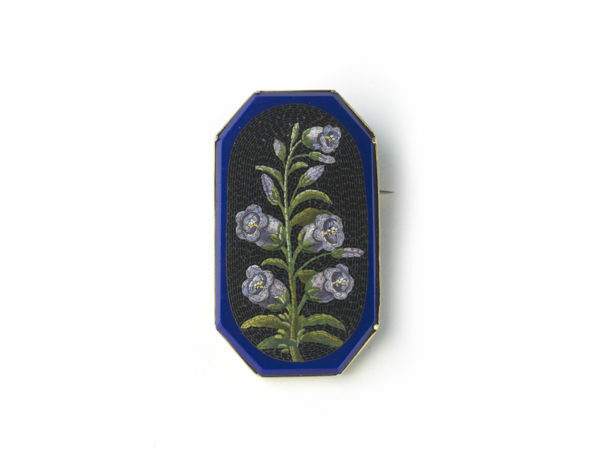 An Italian, antique, micromosaic flower brooch, with a pale blue campanula plant, in micromosaic, on a black background, in an opaque blue glass surround, mounted in a gold, rub over set frame. Circa 1870. Micromosaic jewellery became popular during the Grand Tour period (17th – 19th Century). Members of rich European families would travel around Europe, taking in the sights and cultures of different countries. Italy was a very popular point on the tour. Many micromosaics were exported to jewellers in London and Paris. Micromosaic jewellery fell out of fashion in the 1870s.